This, dear friends, is your lucky day. I am about to share a recipe for the best Vodka Sauce you’ve ever tasted. Seriously…this stuff is a. maze. ing. This recipe comes from a lovely friend, Erin, who acquired it from her uncle, whose friend, Charlie, came up with it. Follow all that? The first time I had the pleasure of this sauce was during college, when Erin whipped it up to the great delight of everyone in our sorority house. We were all hooked. Our biggest problem after that, was figuring out who was old enough to buy the vodka, so we could make it again. This is a rich sauce; not exactly what you would call diet-friendly. But, all things in moderation. It’s worth it! Just hold your breath while you pour in the quart of cream and drop in the stick of butter. It’s gonna be a long run for me tonight! A little note about Mise En Place – The French phrase, Mise en Place, pronounced MEEZ-on-plahs, roughly translates to “everything in its place”. In the culinary field, this refers to the practice of gathering, preparing, and organizing ingredients prior to beginning the cooking process. I’ve mentioned this all before, but I say it again because I truly believe that mise en place is the #1 thing you can do to make cooking a successful, enjoyable experience. Now, my mise en place isn’t always nicely arranged on a tray. That just makes a pretty picture. But, I do prepare my mise en place almost every time I cook. Sometimes I do it just prior to cooking. Other times, I gather, measure, and prepare things whenever I have a moment over the course of the day. This way, when dinner time rolls around, I’m ready to cook! The practice of preparing your mise en place will save you many headaches and a lot of frustration. It will save you from burning the soup, while you’re searching for a spoon or from overcooking the green beans while you’re chopping the garlic. You’ll be just like those chefs on TV, skillfully whipping up delicious meals with ease. But, enough about mise en place. Let’s get cooking! Chop onion and garlic and cook in olive oil until soft. Add prosciutto and cook for a few minutes. Form mixture into a circle with a hole in the middle, pour vodka in the center of the circle and allow to cook off (about 5 minutes). **Pour vodka into a shot glass or other wide-rimmed container before pouring into the pot. Never pour alcohol directly from a bottle into a hot pan. It is flammable and there is a chance that flames could find there way into the bottle and cause it to explode. Cut into quarters or eighths and add tomato pieces to mixture. Add cream and tomato paste, stir until combined and hot. Add cheese and butter and simmer over low heat for approximately 30 minutes, stirring occasionally to prevent burning. Season with salt and pepper to taste. About 1-2 tsp of each should be good. Serve over penne pasta. This dish pairs nicely with steamed asparagus or peas. Remember that garlic we roasted last week? (Click here for a reminder.) Combine 1 head of roasted garlic with 1 stick of softened butter. Cut a loaf of Italian bread in half lengthwise. Spread the roasted garlic butter on both halves. Put the halves back together. Wrap the loaf in foil. Bake in a 350 degrees oven for 20-25 minutes. Cut into slices and serve with the Penne ala Vodka. Posted in Breads, Cheese, Culinary Techniques, Dressings and Condiments, Food, Main Course, Recipes, Sauces and tagged bread, Cooking, Eating, Food, food photography, garlic bread, italian food, pasta, Recipes. Bookmark the permalink. Which Erin? I can’t wait to try it!! Sheerin! It’s SUCH a great recipe! Goodness gracious, this looks outstanding!! What better time to make it then while pregnant (bc calories don’t count then, you know;) ) . Can’t wait to try it. ok… now my mouth is watering! I think I’m going to pick up some prosciutto at the store tomorrow and make this. yum! thanks for posting! You are very welcome! Enjoy it! This really is the very best vodka sauce ever. I remember in Geneseo putting it on my salad instead of dressing; it’s that good. Now that I make it myself, I usually make a little extra for the next night as it’s even better the second day (the basil sets in more maybe?). Hmmm, I may have to make some now, getting hungry just thinking of it! Hi There! Visiting here from Erin’s FB post. Great blog and sounds like a delicious recipe that I will give a try. Thanks! Hi Andrea! Thanks for stopping by! Yes, the vodka sauce recipe is a definite keeper! Enjoy! Yes, please keep me posted! 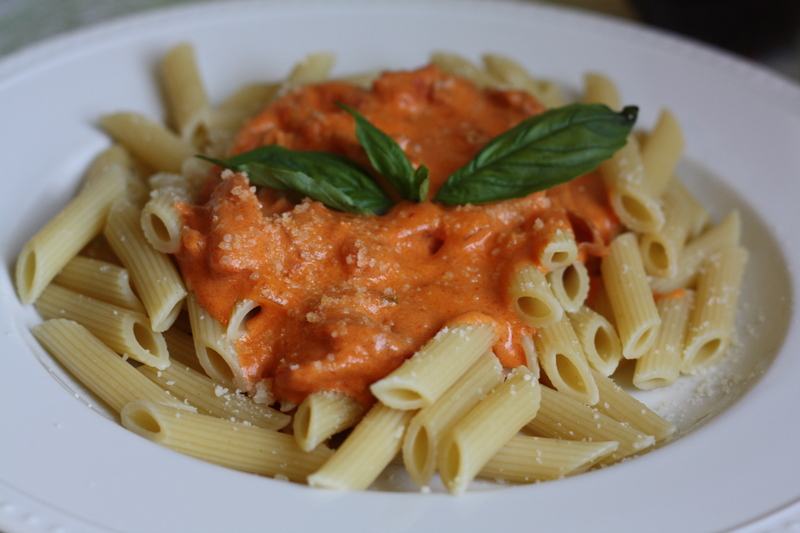 This vodka sauce recipe is really fantastic! One question….. Approximately how many servings does the Vodka Sauce make ? Oops! Sorry about that. I must get better about including serving sizes. The recipe makes a bit ol’ pot of sauce. I’d say about 8 servings. recipe calls for 1 can of plum tomatoes what size can? Sorry about that. I keep meaning to go back and fix that omission. It’s a large can…maybe somewhere between 25-30 ounces? I’ll need to actually look at the can in the grocery store to tell you for sure. Hi there, I’ve never had an issue with flame-ups while making this dish, but if you’re unable to turn off the fan, you could do a few things for extra safety. 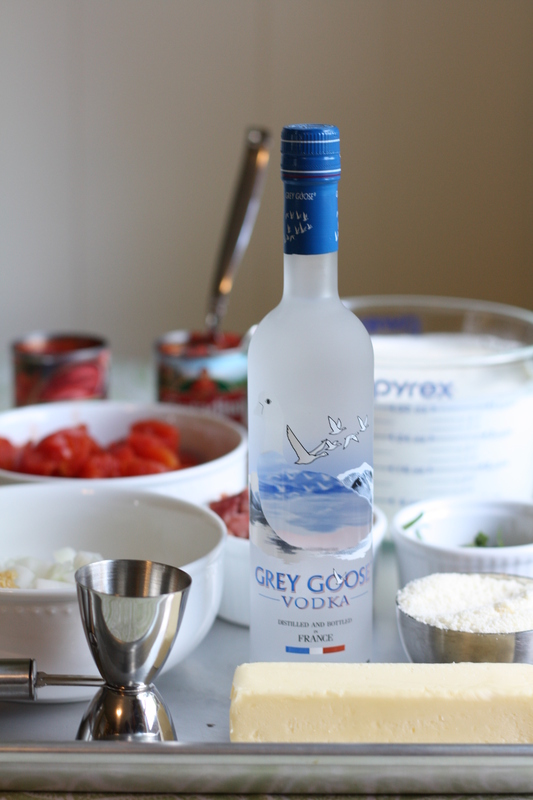 First, make sure you pour the vodka from a measuring cup or other wide-mouthed container. Don’t pour directly from the bottle, since if a flare-up occurs and reaches its way into the bottle, it could cause the bottle to explode. Secondly, use a high-sided pan. This will reduce the risk that any of the alcohol comes into contact with the flame. Thirdly, keep a pan cover nearby, so that if a flare-up occurred, you could quickly cover the pan to contain the flame. Otherwise, as long as you add the vodka carefully to the center, you should be ok. Enjoy the sauce! It’s delicious! What kind of vodka should I buy. Any unflavored vodka will do the trick. In college we would make it with the cheapest vodka we could get our hands on and it was still delicious. Now I tend to buy something a little nicer…absolut, grey goose, belvedere. 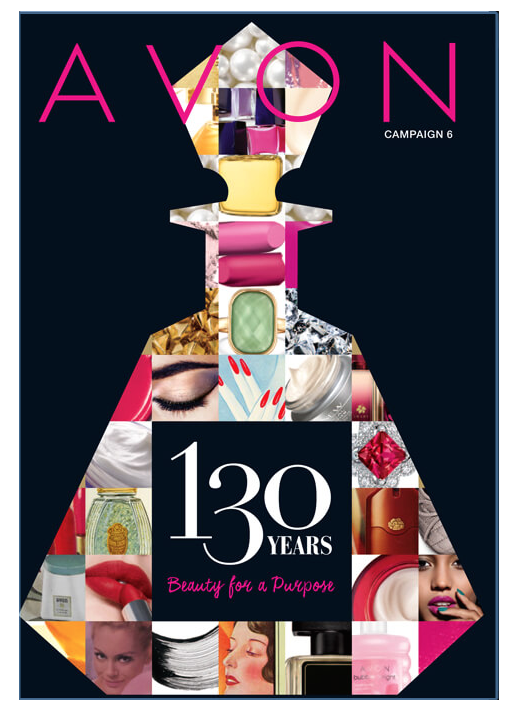 OMG….So good! I made this today for guests and we all loved it! Thank you so much for it! Can you freeze sauce separately? Wanting make a baked ziti as a freezer meal, but you stated reheating would not be good. Thank you for this recipe. It was really good. I used 28oz of fresh chopped tomatoes and the flavor was so amazing. Definitely a keeper recipe. Bravo! 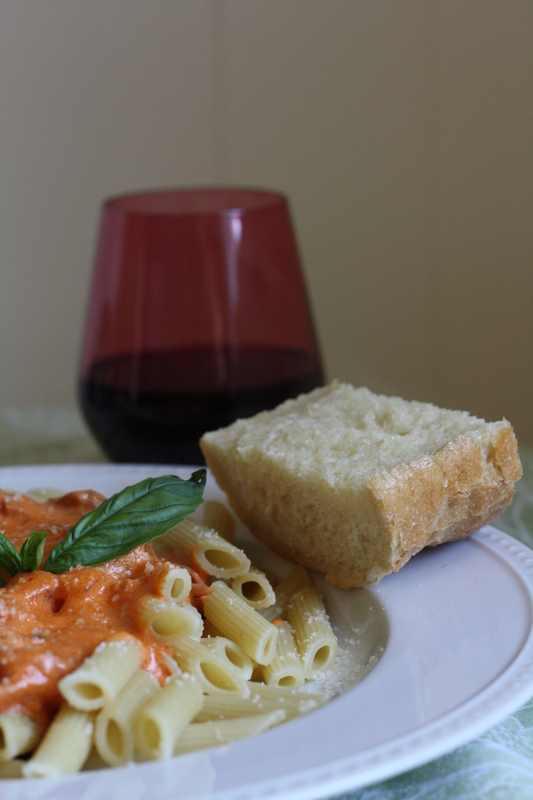 This recipe makes the absolute best Vodka Sauce!! It’s so easy and you won’t believe how delicious it is. I will sometimes make two batches and freeze a bunch to have it on hand for whenever we have a craving. Love it! It is a very rich sauce, like you said. If you like to drown your pasta in sauce I would ease into this one. You don’t need much of it per plate to lightly coat the penne. I recently visited New York where I had my first taste of this sauce. I made this for dinner and everyone loved it. I love it! The best sauce Ever! This was by far the BEST vodka sauce!!! I have been on a quest for yeard to make one similar to a favorite restaurant we no longer live near and this one is the closest to it. Soo Delish!! Just finished making this so delicious and a great recipe everyone went for seconds thank you! I complemented it with parm crusted chicken and Toasted garlic butter Italian bread ! I have enough for seconds and am going to freeze it for later! Truly an amazing top quality outcome! YOU WILL NEVER ORDER THIS IN A RESTAURANT AGAIN AFTER MAKING THIS!!! I am a top home cook for years with vocational schooling in culinary and I can tell you this what vodka sauce should be. Thank you for a great one.